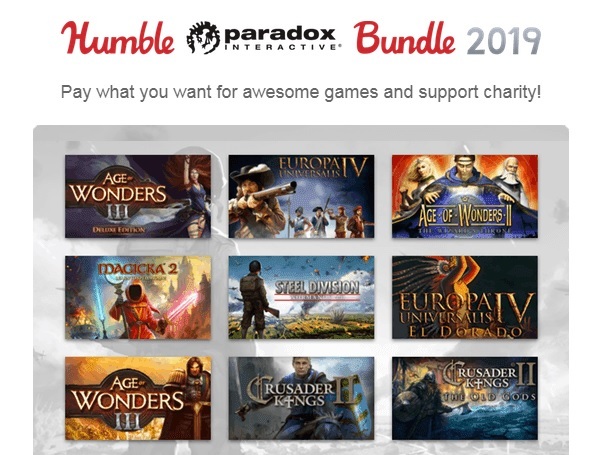 Temos mais um pack Humble Bundle, com jogos da Paradox Interactive como Steel Division, Age of Wonders, Magicka 2, e Europa Universalis, entre outros. Por apenas 1 euro ficamos com Age of Wonders II: The Wizard's Throne; Darkest Hour: A Hearts of Iron Game; Magicka 2; Crusader Kings II. Por 6 euros adicionamos: Age of Wonders III; Expansion - Crusader Kings II: The Old Gods; Europa Universalis IV. E por fim, por 11 euros, juntamos: Steel Division: Normandy 44; Age of Wonders III - Deluxe Edition DLC; Magicka 2 Deluxe Edition DLC; Europa Universalis IV - El Dorado.